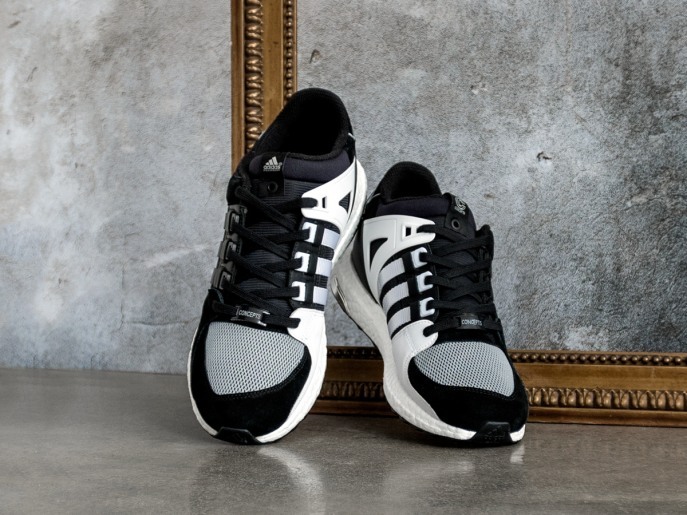 Originally released back in 1993, the original EQT Support provided runners with stability and comfort. Over the following two decades it has grown from a classic runner into a style staple. 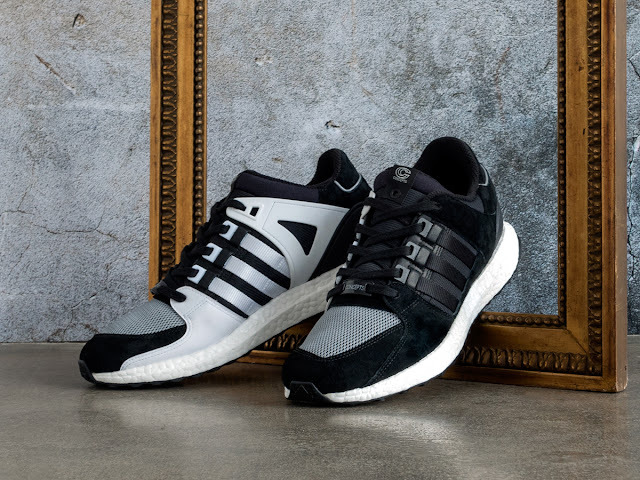 adidas Consortium partnered with Concepts and elevated the EQT Support, in its most luxurious form ever. They took the sneaker’s performance legacy, added a modern sole and they gave the shoe a makeover using premium materials topped off by subtle ennoblement's such as gold accents and silver/reflective highlights. The significant shift with the 93/16 model is the inclusion of the boost sole, drafted in from adidas’ current running footwear. 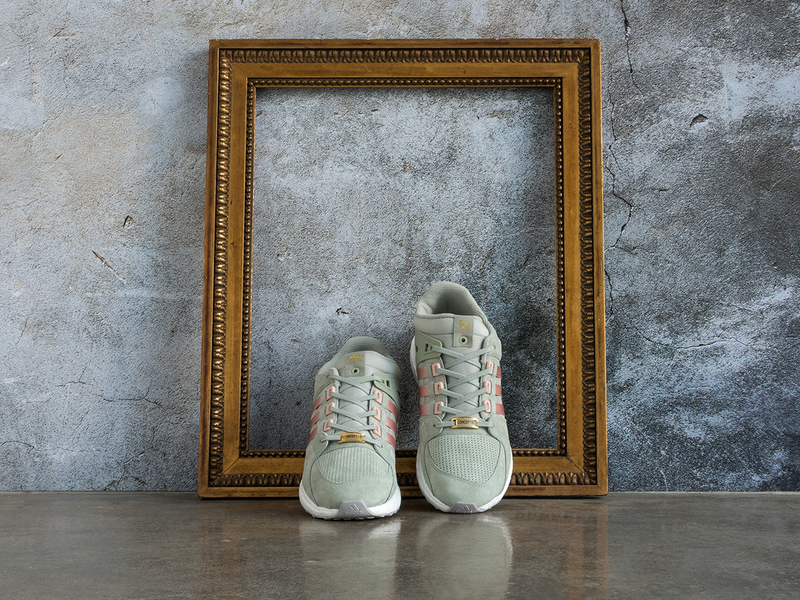 The boost provides supreme comfort and contemporary lightweight cushioning. 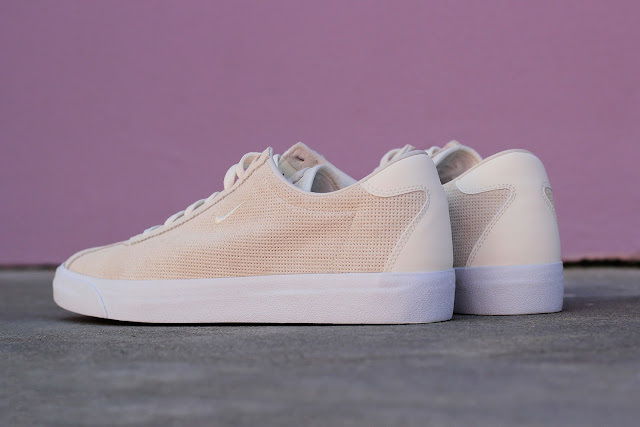 This release arrives in a black and white colour combination as well as a sage and light plush pink, both models come in soft suede with either a perforated toe-box or reflective mesh toe-box detailing. The adidas Consortium x Concepts EQT Support 93/16 drops on Saturday, 10 September 2016. 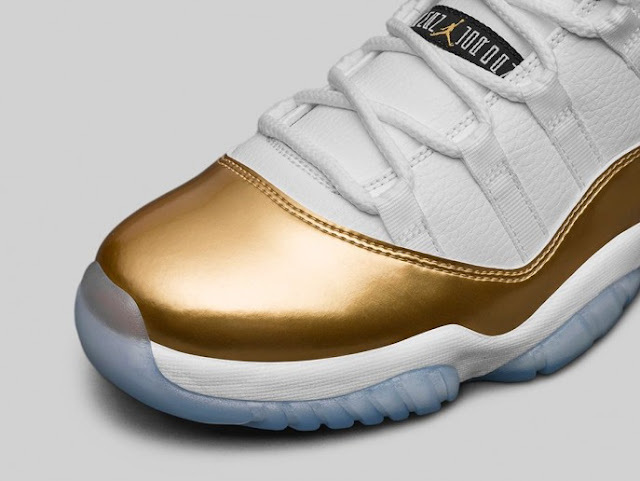 The Nike Air Jordan 11 Low ‘Closing Ceremony’ sneaker was inspired by the Olympics closing ceremony that took place on Sunday, 21 August 2016 at the Maracanã Stadium in Rio. 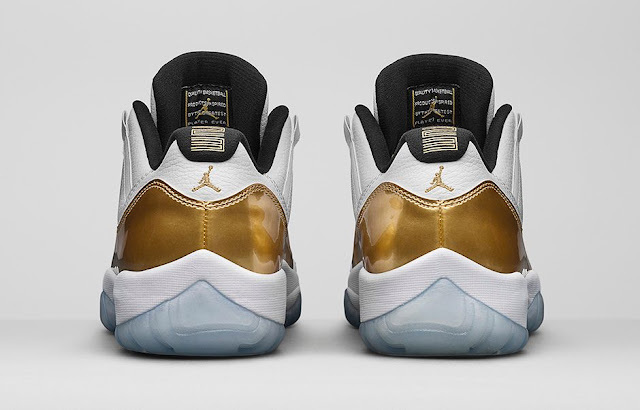 The low-top is defined by a shimmering gold hue that connects to the first-place medals given out during the award ceremonies. Premium white leather is also utilized for the remainder of its upper for more flair, while tonal black accents adorn the inner lining and tongue for a complementing contrast. 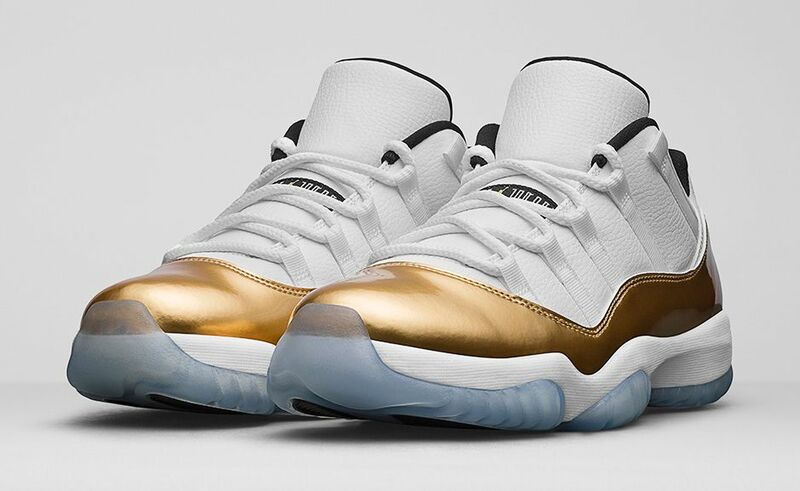 The Air Jordan 11 Low ‘Closing Ceremony’ is available at selected retailers. PUMA shakes up performance running with the introduction of IGNITE evoKNIT. 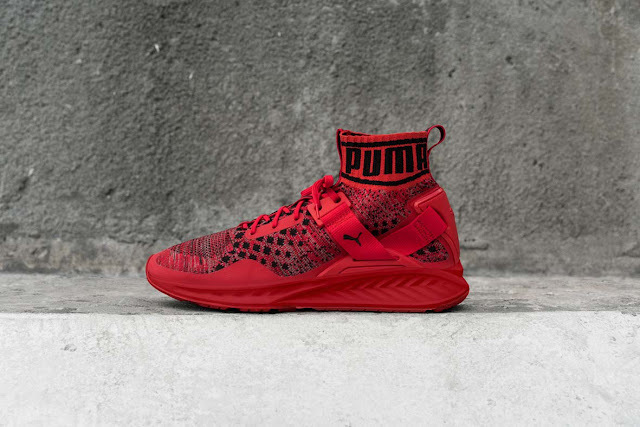 Featuring all-new evoKNIT technology and striking visual details, IGNITE evoKNIT effortlessly combines PUMA’s innovative running technology with disruptive streetwear design. IGNITE evoKNIT makes its aesthetic mark with a fully knitted upper for form-fitting comfort, stretch and breathability, plus a branded, collared sleeve along the ankle for full support and a street-ready look. The upper also features a supporting strap that allows stability within the heel to lock it onto the platform of the shoe. 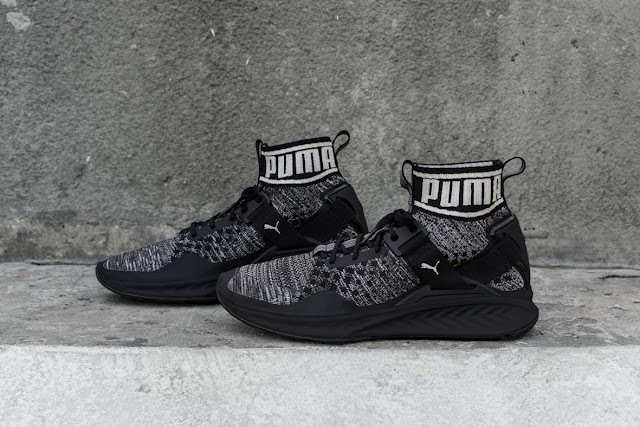 The midsole features IGNITE Foam, PUMA’s proprietary material with exceptionally responsive, energy-returning qualities. 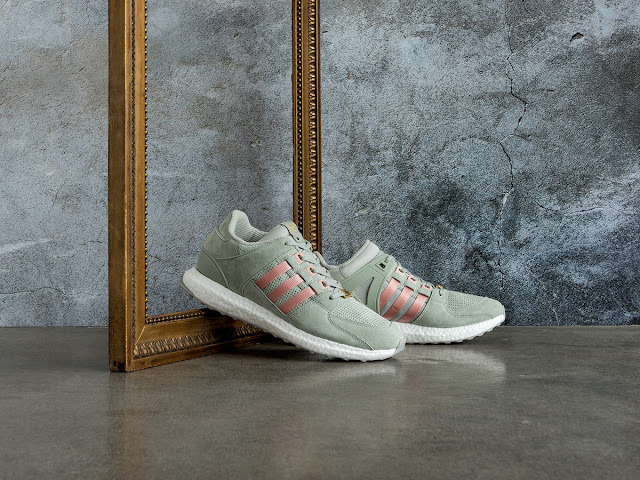 This premium cushioning is enhanced by a chevron grooved design that has been sculpted to compress during landing and rebound, providing spring and energy with each step. 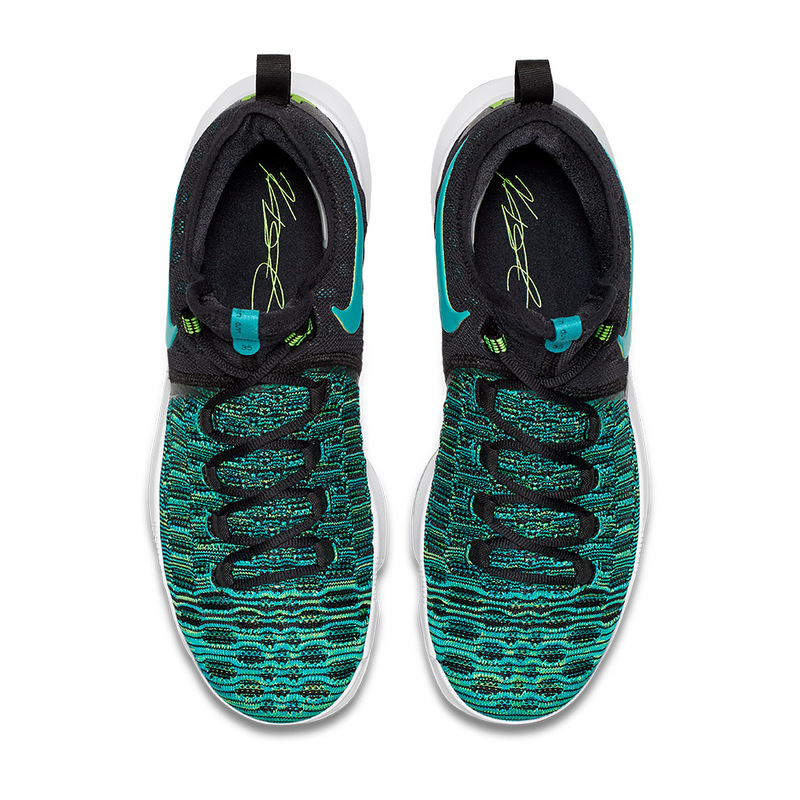 The outsole incorporates a transition line that runs from heel to toe to mimic the runner’s natural gait. This guides the runner through a smoother toe-off and overall ride, with durability and traction infused into the heel and forefoot. IGNITE evoKNIT is a true performance running shoe, providing key features that serious runners require. 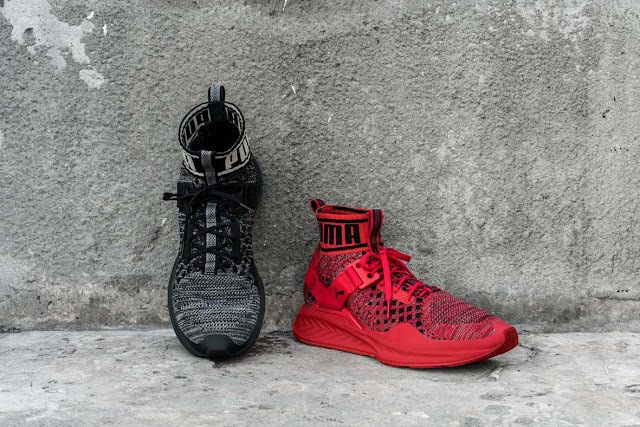 While acknowledging these key performance innovations and benefits, the IGNITE evoKNIT exudes a contemporary streetwear-inspired vibe. The knit features a mix of three colours for depth and dimension, and the sleek upper and bold collar give it an eye-catching, youthful appeal. It intertwines fashion and design with innovation and technology. IGNITE evoKNIT is made to be the boldest on the block. It’s designed to be unstoppable, whether it’s worn hitting the streets or heading out for the night with friends. The PUMA IGNITE evoKNIT is available at selected retailers in Quiet Shade (Black) and High Risk Red for R2599. 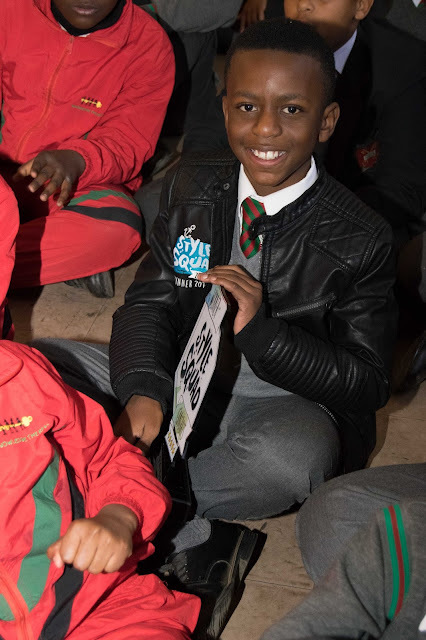 Ten year old Luzuko Banda (aka “Zuko”) of Germiston had his creativity well rewarded when he was selected as the winner of the 2016 Ackermans Style Squad competition. He was chosen from 20 finalists from across South Africa who shared their love for fashion in the value retailer’s annual competition for 9 to 14 year olds. 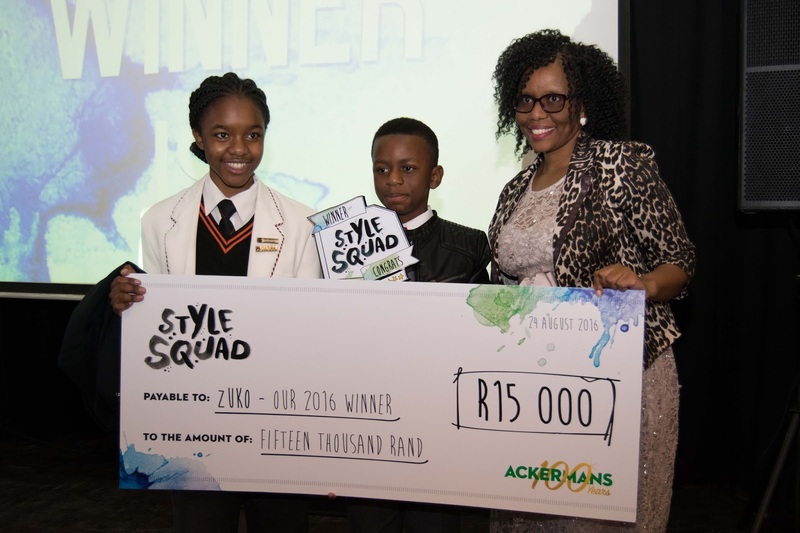 The Style Squad participants received Ackermans vouchers to spend on creating outfits for the nine fashion related challenges they had to complete and share in their blog posts on the Ackermans website. They also received an iPad mini and data to use for their monthly blog posts that showed other kids and their parents how to be on-trend without breaking the bank. “Zuko has such great confidence and style. He really impressed the judges in the Fashion DIY activity with how he transformed his merchandise into something extraordinary, trendy and unique. He could take items and make them his own through styling and accessorising. His blogs were well written, easy to relate to and fun to read. 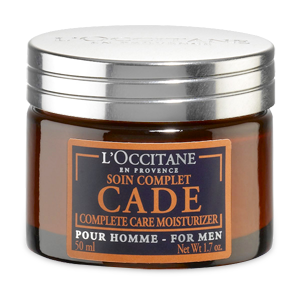 He put a great deal of effort into every activity,” says Tanya Ruiters, Marketing Specialist of Ackermans and Project Manager for Style Squad. Zuko won R15 000 cash as well as a R15 000 educational policy to further his studies. Over the past 12 months, he has also been given R2 250 worth of Ackermans vouchers, an iPad mini and 24GB of data. His prize was handed over on Wednesday, 24 August at Freeway Park Primary in Boksburg, where he goes to school. Ackermans will once again give fashion savvy South African kids a chance to show their style and creativity with the 2017 Style Squad competition, where they can win their share of R250 000’s worth of prizes. The 2017 Style Squad entry details will be uploaded on the Ackermans website on 1 September 2016. 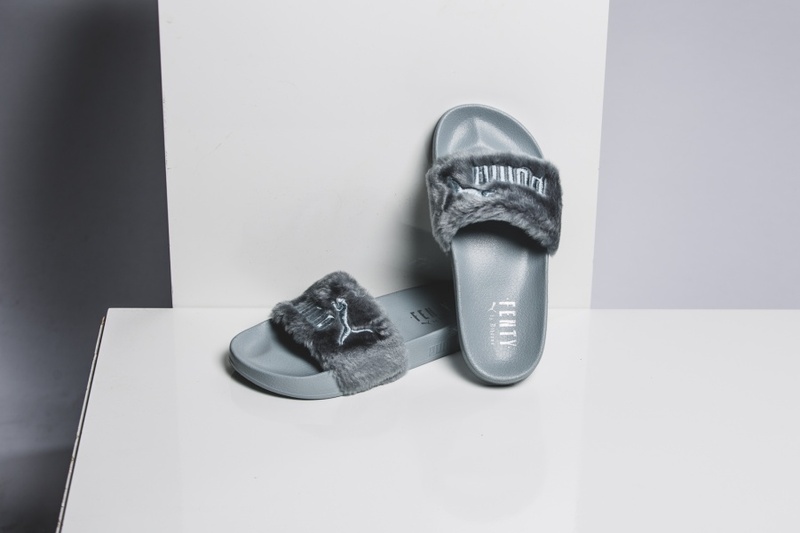 Following up on the re-stock of the black, white and pink colorways (which happened on the 24th of August), PUMA and Rihanna are dropping the spring/summer FENTY slides in another color option, grey. The footwear is built on the Leadcat silhouette, then featuring a faux fur strap with a satin foam backing to enhance comfort. 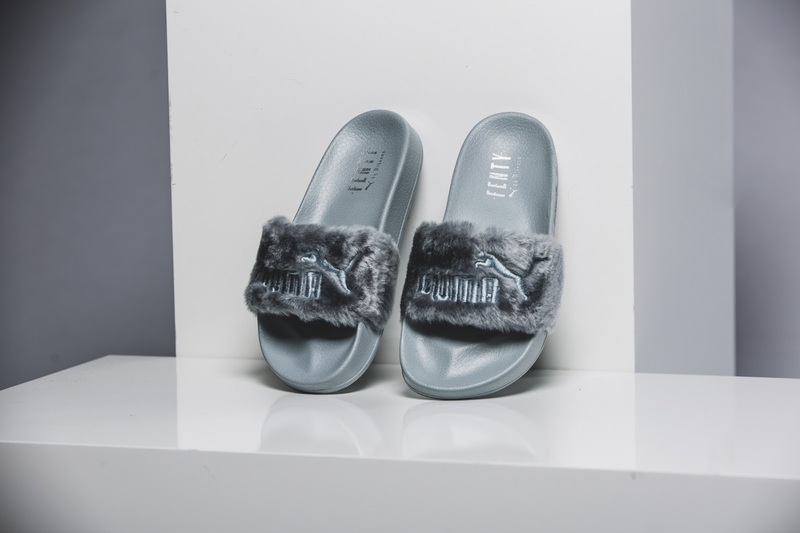 FENTY PUMA by Rihanna branding has in turn been applied on the heel and the footbed to complete the slides. The Grey Rihanna x PUMA FENTY Fur Pool Slides is available at selected retailers. The Nike KD 9 Birds of Paradise colourway was unveiled during Kevin Durant’s latest trip to Greater China as part of his Nike Basketball tour. 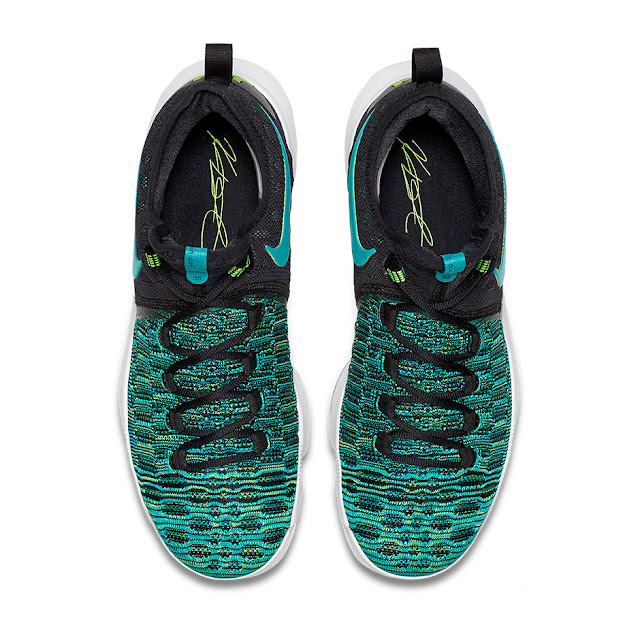 The sneaker is essentially defined by its flyknit upper dipped in a mixture of teal and green, the vibrant palette is complemented with tonal black located on the rear, inner lining, laces and pull tabs, as it all rests atop a white Zoom sole unit. More accents of teal are implemented on the tongue, Swoosh branding on its side panels and midsole as well to round out its profile. 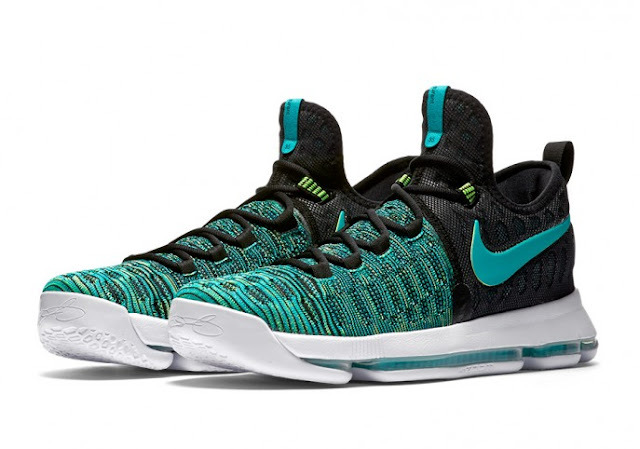 The Nike KD 9 Birds Of Paradise is available at selected retailers. 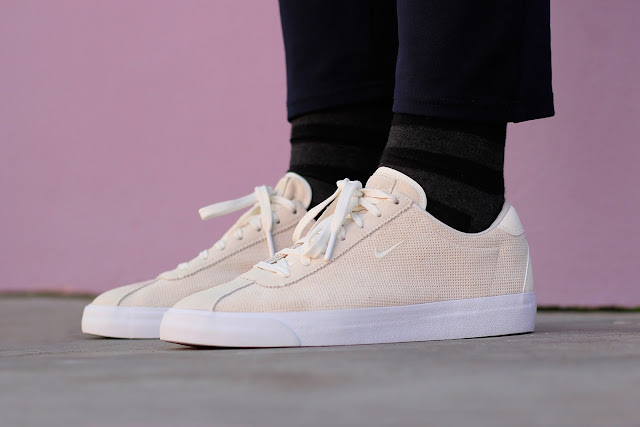 The NikeLab Match Classic Suede is guaranteed to impress as it showcases the best of vintage detailing, paired with Nike's impressive performance technology. The sneaker features soft premium suede. 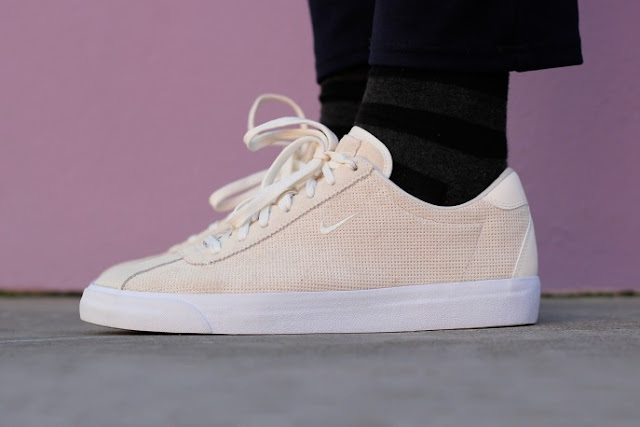 The NikeLab Match Classic Suede is lightweight, durable and keeps your feet cool during the warmer months. To compliment that textured detailing, full panels of suede make an appearance to the lace surround and extend through to the toe. There is also a suede overlay on the heel. All feature in that same tonal shade of Sail. The Match Classic does away with the large and oversized branding. 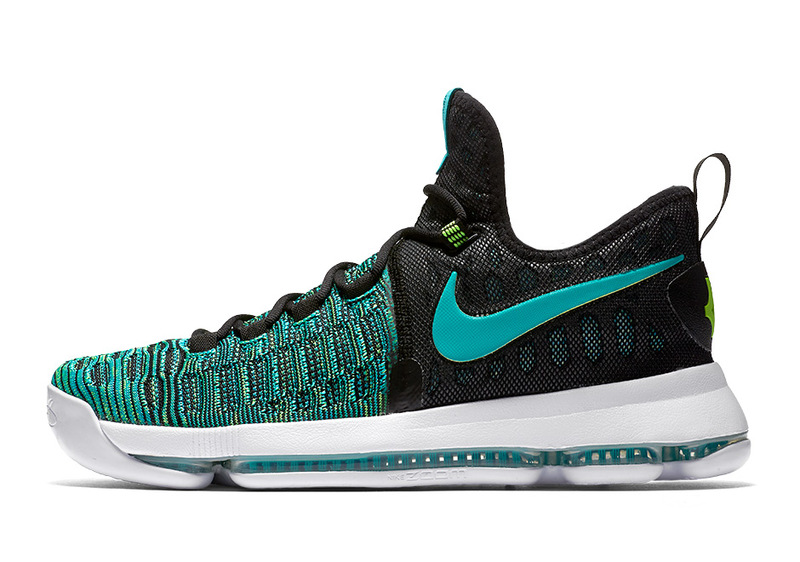 Instead, a mini Swoosh is stamped to the sidewall in white and logos to the tongue remain low key. To complete the look, a white midsole sits underfoot, taking on that low profile aesthetic which is synonymous with retro silhouettes. The Nikelab Match Classic Suede will drop on Thursday, 25 August 2016 at selected retailers. 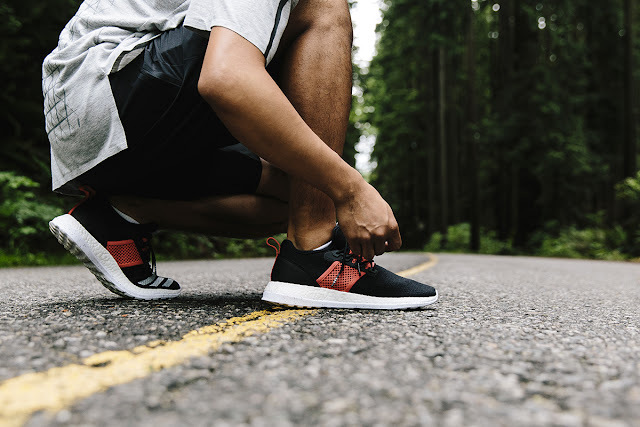 adidas Consortium teams up with Canadian retailer Livestock to deliver a killer two-piece footwear package. The PureBOOST PK ZG and Samba may hail from different eras of adidas’ history but both are bonded by the common theme of dynamic movement. During the conception phase Livestock explored the theme of sporting rhythms; the way elite athletes develop elegant, instinctive physical behaviors. First up, Livestock reworks the PureBOOST PK ZG, a modern running silhouette. 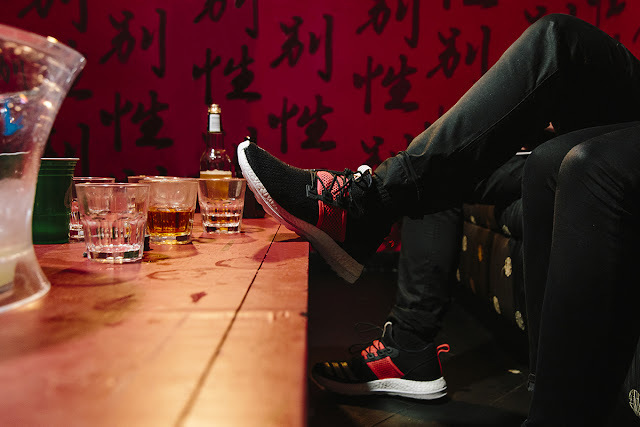 The black Primeknit upper is emboldened by a rich elastic crimson cross strap across the shoe’s body and contrasting screen printed stripes on the outer toe-box. 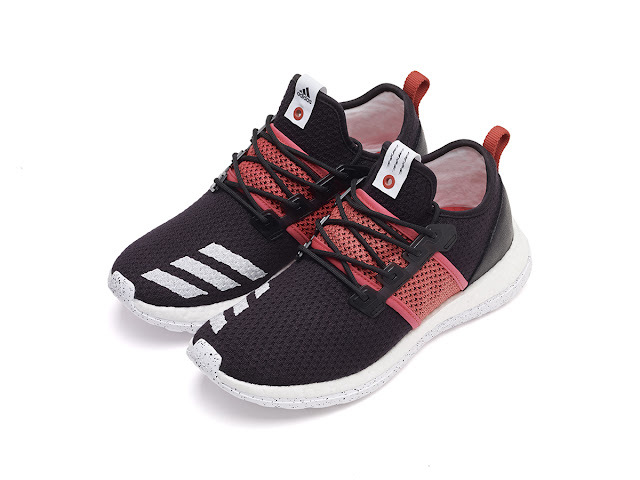 The PureBOOST PK ZG’s sporting capacity is world renowned; it is a market-leading performance model. This version also features low-key Livestock insignia on the tongue and insole. From cutting contemporary to something a little more classical, Livestock goes throwback with the adidas Samba. Whether it is indoor football or skateboarding, the Samba has lived on the front-line of sporting action for decades. Livestock's execution features black hairy suede and keeps detailing understated: we are talking screen printed stripes on the lateral and tonal leather stripes on the medial side as well as subtle gel-print lettering. Red is reserved for the insole and tongue label eyelets. The PureBOOST PK ZG & Samba will be available from 3 September 2016 at Shelflife store in Cape Town and Johannesburg. PUMA releases a new collaborative collection with British cotemporary label McQ for Autumn-Winter ‘16. 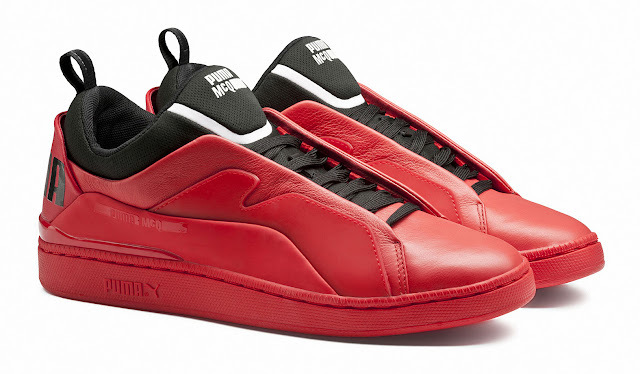 The premium styles in the footwear range speak of a dual language of sport and fashion – a juxtaposition between McQ’s rebellious spirit and PUMA’s rich sporting history and product innovation. 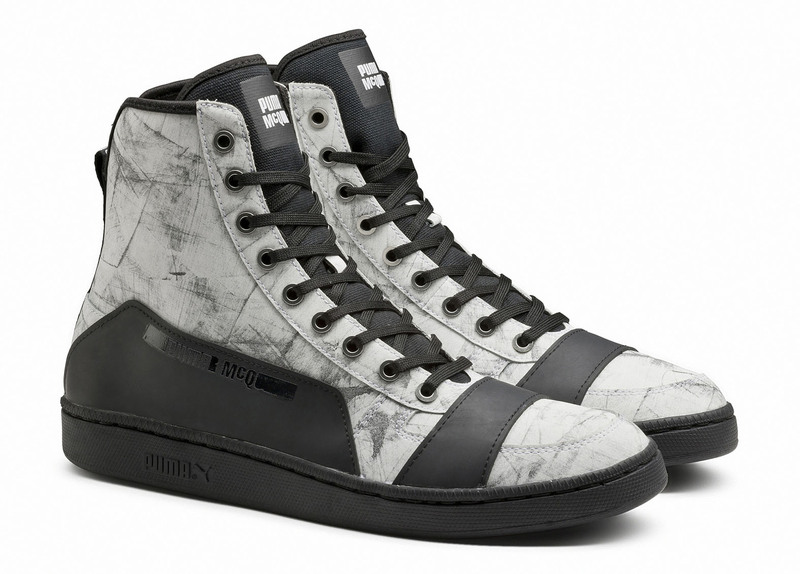 The collaborative collection showcases McQ’s use of experimental surfaces with PUMA’s classic silhouettes. The collection incorporates styles such as the Move Lo Lace Up in metallic finish to the Tech Runner complete with McQ graphic (R2 499). The new upper on the Tech Runner is a twist on the iconic tooling, held in contrast to the soft smooth surfaces in black and white and hand brushed graphic effect. Another key style is the Cell Bubble Runner (R2 899), a continuation from the previous season, carried forward for AW’16 with a more futuristic silhouette. Additionally, the Brace Lo (R2 499) and Brace Mid (R2 499) are attributed with a premium ‘cupsole’ silhouette that brings balance to the range. The contemporary silhouette of Brace Lo features a neoprene sock construction, with the upper utilising a rubberised texture, this style is available in bold primary colours. 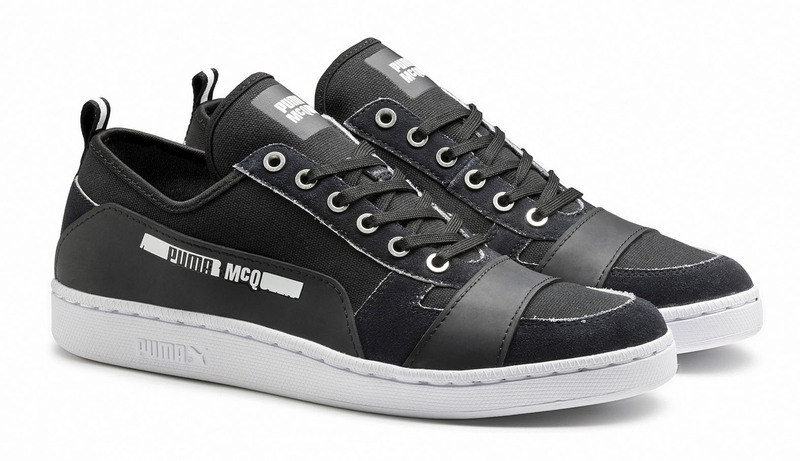 The PUMA x McQ collection drops from August through to November at selected retailers nationwide. Butan Wear has released their second drop for the season! Each piece in the collection has a cool and unique story. 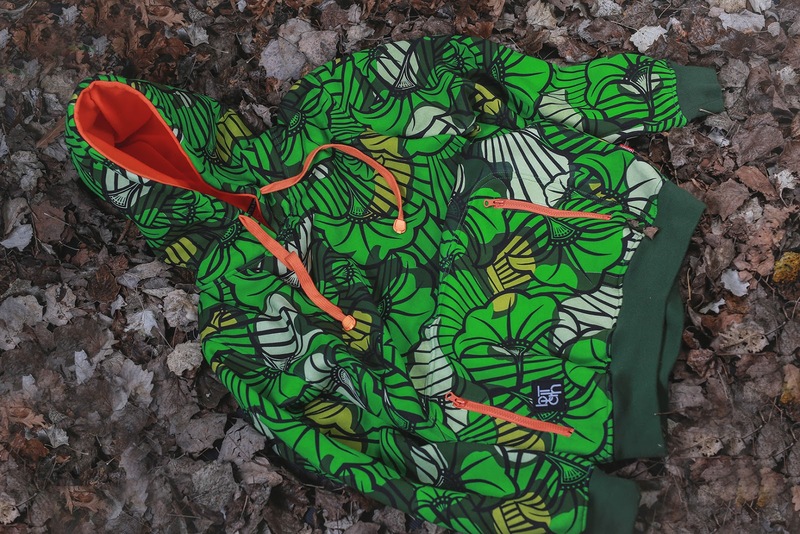 Peep the collection below, which is now available in stores and online! The cap pays homage to the fighting spirit of the indigenous tribes in Africa. It features a a deconstructed traditional shield logo. 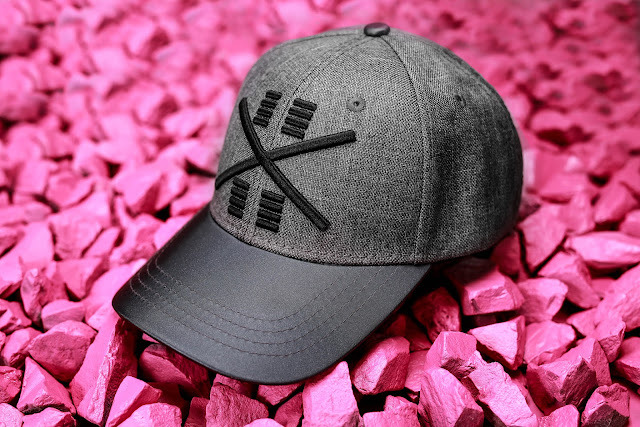 The ‘Black Star’ baseball cap pays tribute to Pan-Africanism with the infamous tri-colour band embroidered on the left temple. 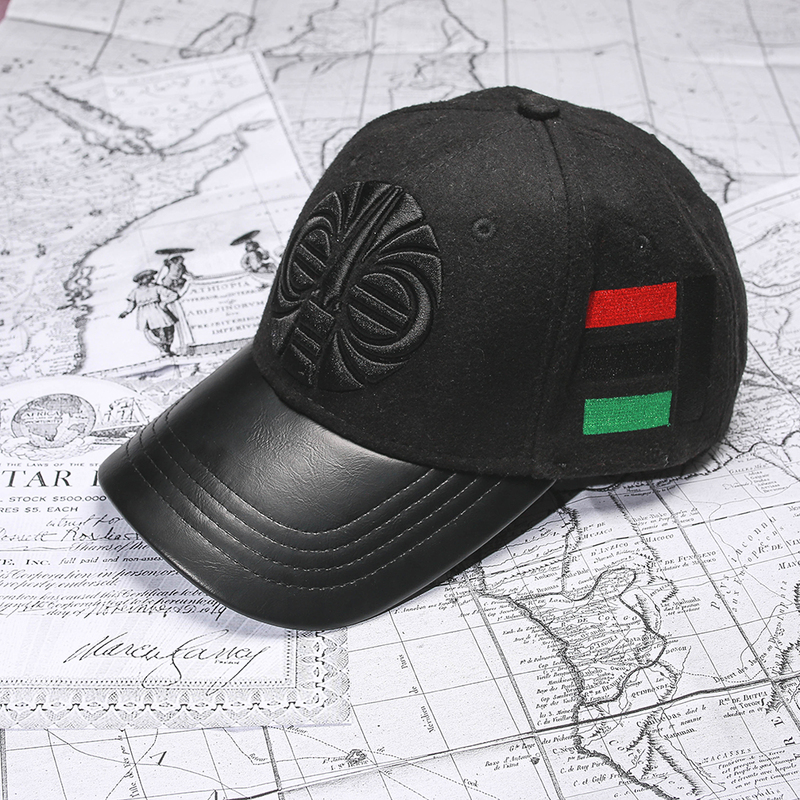 The cap features a tribal mask on the front panel which serves as an identity to the roots of African people. The ‘Wax Camo’ pullover hoody features a combination of abstract camouflage and a pattern which is typically found on West African wax textile prints. 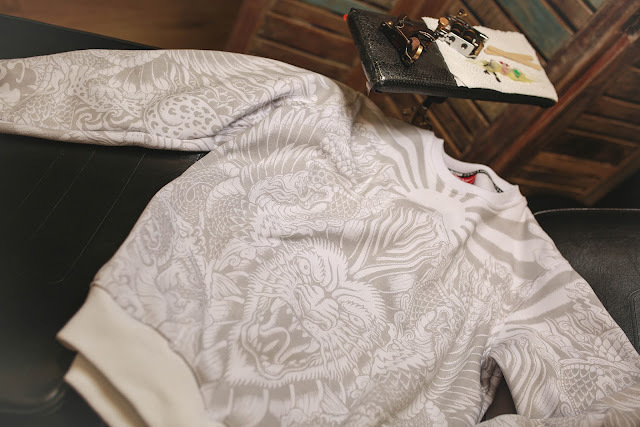 The ‘ZA-Kuza’ crewneck sweater and reversible bomber jacket was inspired by the full body tattoo art which the Japanese Yakuza gangs are known to mark themselves with. 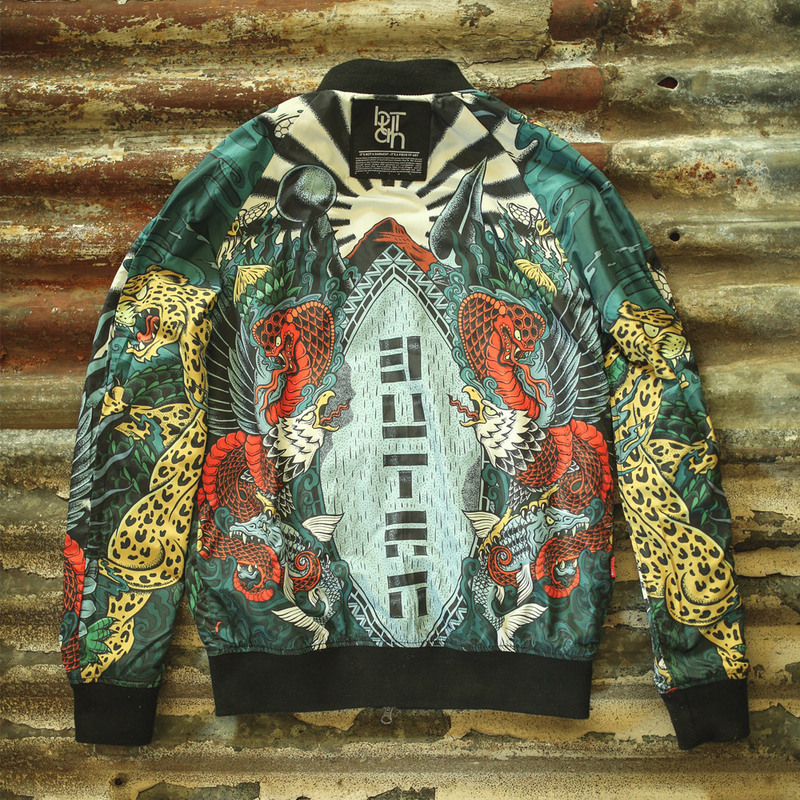 The design has a uniquely South African twist on the art style, incorporating elements indigenous to South Africa in place of the Japanese elements which the Yakuza use. Gentlemen, Today we are celebrating Men’s Grooming Day! 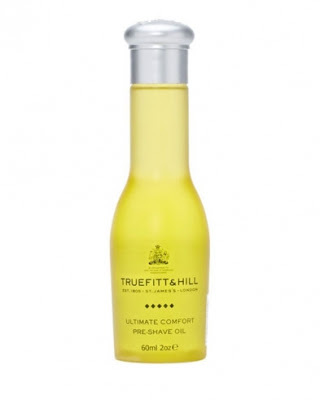 Started by American Crew, the day is celebrated on the third Friday of August each year, so that men can give attention to their personal grooming and hopefully incorporate better grooming practices into their routine. 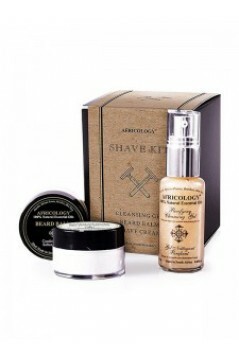 Happy National Men's Grooming Day! 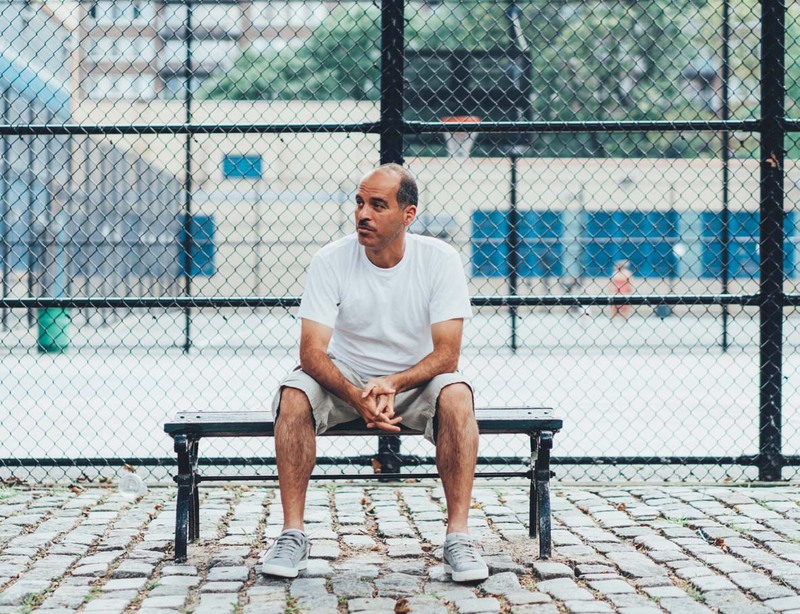 World-renowned DJ and Clyde historian, Bobbito Garcia teamed up with PUMA on two true classic PUMA shoes - the Clyde and the Suede Mid. The end result is a clean cut, sublime aesthetic that is both court savvy and stylish. Bobbito Garcia is the critically acclaimed author of ‘Where’d You Get Those? New York City’s Sneaker Culture: 1960- 1987’. The Suede Mid (R2 299) takes inspiration from the book and Garcia’s basketball experiences with a gold touch etched on the mid upper. Typical outdoor b-ball slang has been applied to the innersole and upper quarter of the Clyde (R1 899), continuing this theme. 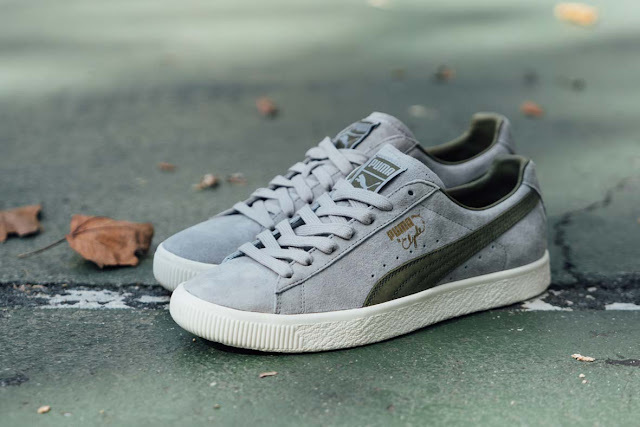 The PUMA x BOBBITO collaboration continues to highlight one of PUMA's most epic sport-inspired styles with its rich material and streetwise swagger guaranteeing its enduring appeal for generations to come. 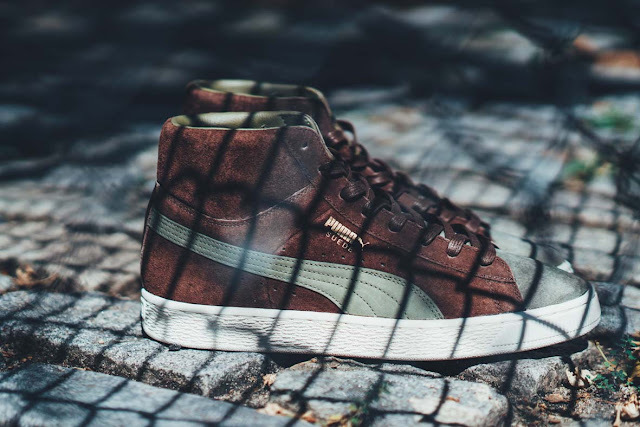 The PUMA X BOBBITO will be available in a Suede Mid and Clyde at PUMA Select Bree Street, Cape Town and Braamfontein, Johannesburg. adidas Originals is bringing us a bold visual update to the OG NMD silhouette. Presenting two new iterations of the ground-breaking shoe with a truly unique twist. Taking a strictly tonal approach to the shoe’s unparalleled design, each element of the NMD’s upper from a stretch mesh construction and welded three-stripes to its TPU heel unit and tab is rendered in pure white and black palettes, sat atop a crisp white BOOST tooling. The NMD_R1’s signature mesh upper has been rendered with a fully reflective finish, creating a truly unique release that’s set to turn heads during the darker nights. The NMD_R1 – Reflective Pack in black and white drops on Thursday, 18 August 2016 at selected retailers. 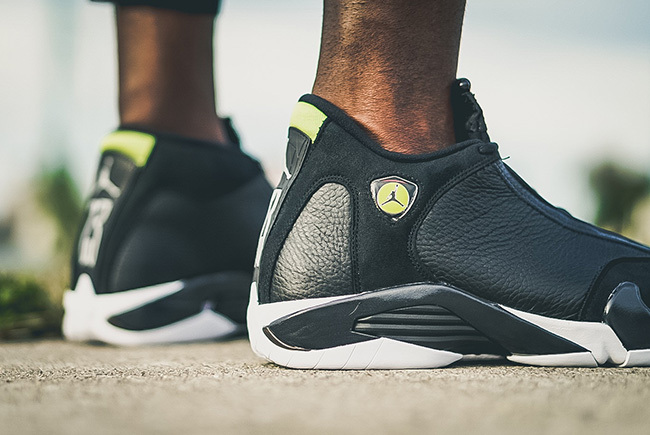 To date, we have seen the Jordan 14 ‘Indiglo’ release just once, back in June 1999. The sneaker is returning in its original colour mashup of Black, White and Indiglo (now being called Vivid Green). Throughout the uppers will be black while done with leather on the panels and by the heel while suede hits the toe box and overlays. White will then fill in part of the midsole then placed through the sole. 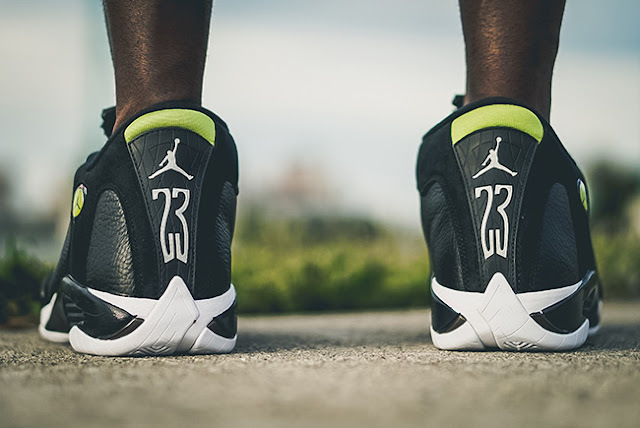 Last but not least is Indiglo green which lands on the Ferrari inspired emblem, top of the tongue and collar and the Jumpman located on the toe and sole. 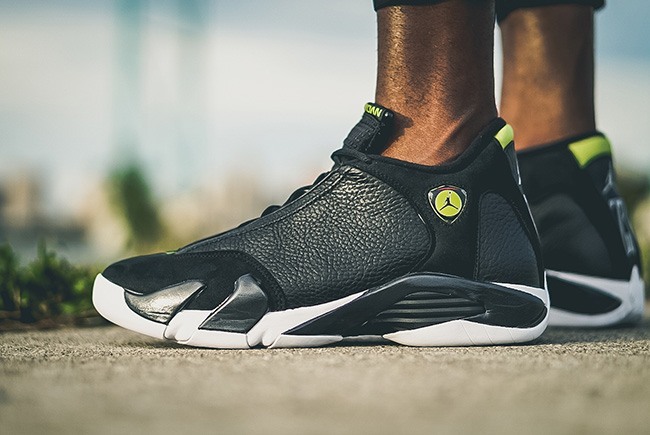 The Air Jordan 14 ‘Indiglo’ is available at selected retailers.